Chateau Doisy Vedrines was once part of the vast Doisy estate which also included Chateau Doisy Daene and Chateau Doisy Dubroca. The original property, founded in 1704 was divided into three parts in 1851. Of the three estates, with its 27 hectares of planted vines, it’s the largest of the Doisy estates. The property takes its name from one of its early owners, the Vedrines family. Today, the vineyard is owned by the well known Casteja family who own numerous estates in the Right Bank including; Chateau Trotte Vieille in St. Emilion , Domaine de L’Eglise and La Croix du Casse in Pomerol . In the Medoc , they own Chateau Batailley in Pauillac as well as a massive negociant company, Borie-Manoux. Interestingly, while Doisy Vedrines is located in Barsac , they use the Sauternes appellation on their label, which is allowed under AOC appellation regulations. The other Doisy estates prefer to include Barsac on their label. The 30 hectare vineyard of Chateau Doisy Vedrines has 27 hectares under vine. The vineyard is planted to 85% Semillon and 15% Sauvignon Blanc . Although there are a few remaining Muscadelle and Sauvignon Gris vines still remaining in the vineyard as well. On average, the vines are 30 years of age. The vines are planted to a vineyard density of 6,500 vines per hectare. The terroir is a mix of limestone, sand and clay soils. To produce the wine of Chateau Doisy Vedrines, vinification takes place in a combination of tank and French oak barrels. Fermentation starts in tanks, but is transferred and finished in French oak barrels. The wine is aged in 60% new, French oak barrels for an average of 18 months. 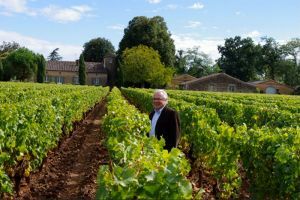 Located close to Chateau Climens , the large estate produces an average of close to 5,000 cases of Doisy Vedrines per year. There is a second wine , Le Petit Vedrines. They also make a dry, white Bordeaux wine, Chevalier de Vedrines.